We develop novel tools for spectral analysis and estimation, significance testing, noise filtering and prediction of time series in geophysics, finance, and biomedical sciences. 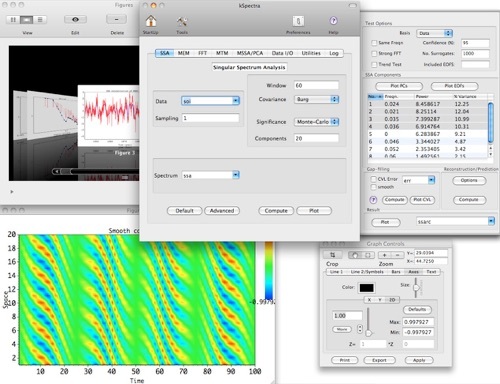 Check out our flagship software product - kSpectra Toolkit for Mac OS X! Using spectral estimation tools of kSpectra, time series is decomposed into noise and significant components - trend and oscillatory modes, which can be reconstructed and predicted! Gap-filling procedure is provided for spectral analysis of datasets with missing observations or non-even sampling. The advanced techniques of kSpectra for univariate and multivariate time series include Blackman-Tukey Correlogram and Cross-Spectrum, Multitaper Method and Coherency, Maximum Entropy Method, Singular Spectrum Analysis and Principal Component Analysis.